The students were eager to show their guests how. “Are you ready,” asked the third-grader with eyes open wide behind her science goggles. “Get ready,” warned her peer scientist leaning back with a broad grin. “Here it goes,” said a third student holding a small cup of baking soda. With a pinch of the powdery substance, the mystery liquid in the glass bubbled and fizzed over the edge much to the delight of the three-student lab team and observing adults. “It’s vinegar,” the third-graders exclaimed, and then confirmed the identity of the three liquids in the other glasses – hand sanitizer, Sprite and water – to their science lab guests. There was applause. There was laughter. But most importantly, there was learning. 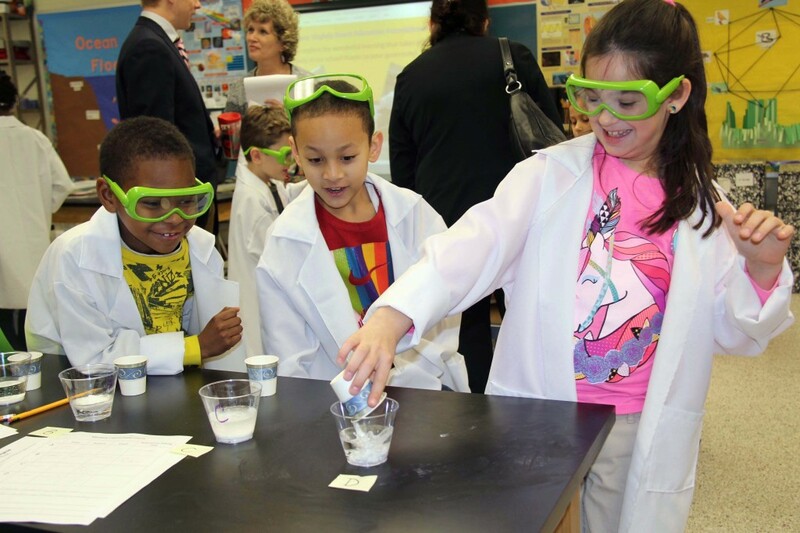 Tallwood third-graders conduct an experiment using “mystery liquids” and baking soda to learn materials’ physical and chemical properties. Virginia Beach Education Foundation (VBEF) board members visited Tallwood’s science lab to see firsthand how VBEF grants are supporting the foundation’s mission “to fund innovative and creative learning programs for students.” Tallwood earned a $5,000 VBEF Schoolwide Grant, underwritten by CH2M Hill and Beach Windows & Siding, to support its plan to transform one classroom into a science lab to be used by teachers and students of all grade levels. Complete with science lab tables and stools, microscopes, experiment materials of all kinds, goggles and the all-important scientist lab coats, the room resembles a secondary school science lab. 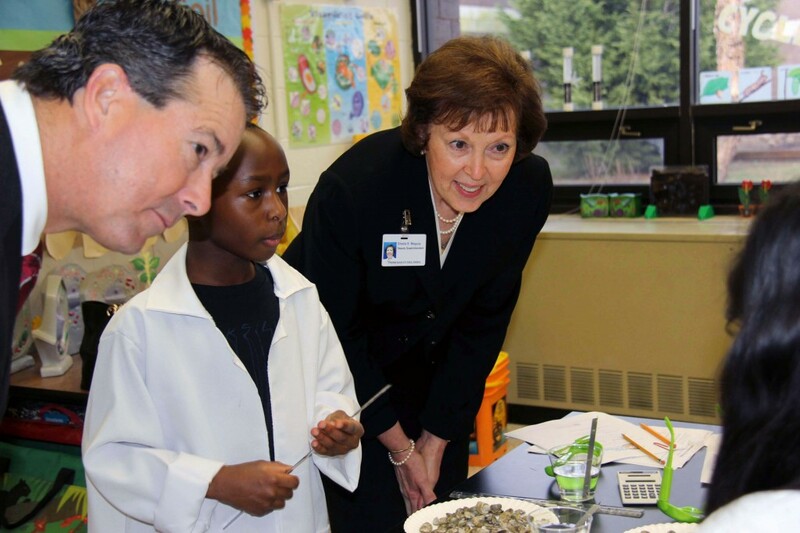 VBEF President Nelson Adcock and VBCPS Deputy Superintendent Sheila Magula observe a Tallwood student in the science lab. “It’s awesome,” exclaimed the group in unison. “I like it because I love science, and this is just the room for me. Science is awesome and this room is awesome,” one fifth-grader said. Tallwood principal David French builds on the student’s comment to highlight the lab’s value for teachers. 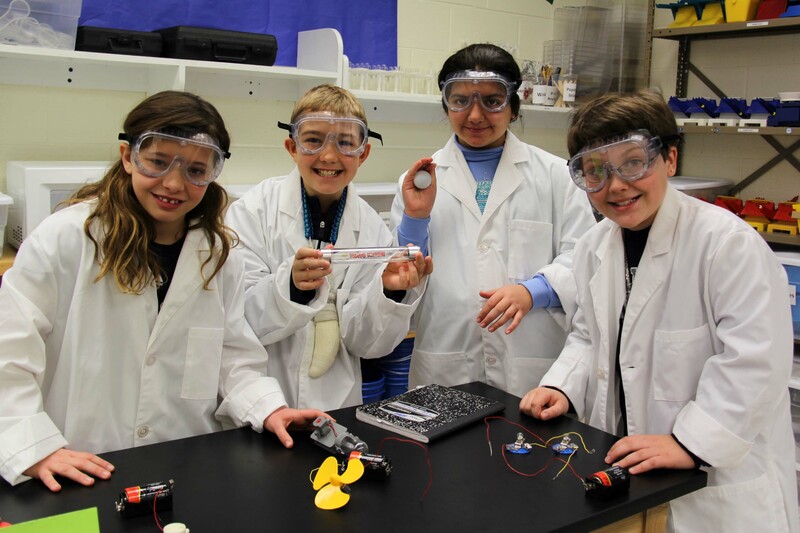 Fifth-grade students study electrical circuits in the Tallwood Elementary science lab. French added that the lab is successful thanks to the valuable assistance of parent volunteers who help set up the room prior to class visits to ensure that students’ time in the lab is spent learning. It also provides a great opportunity for parents to be engaged partners in education by taking an active role in the scientific experiments. Tallwood’s new science lab provides for those opportunities and much more. Just ask the fifth-grader in the lab coat and goggles.